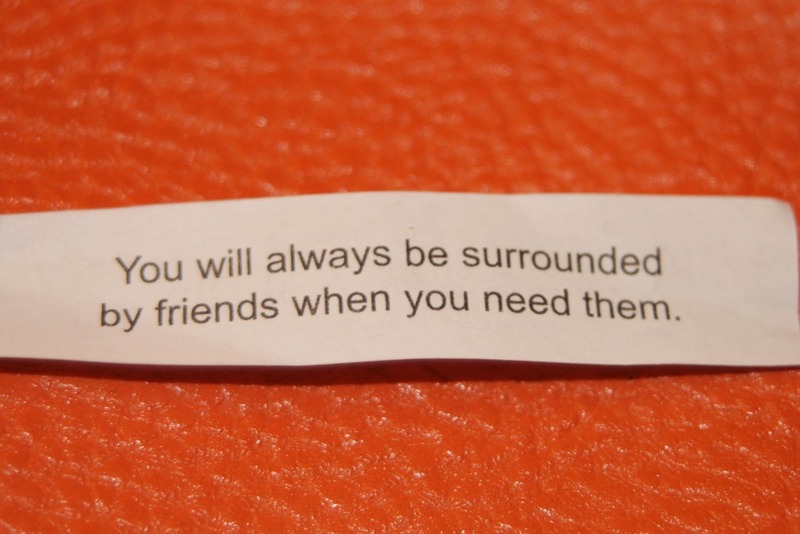 I have had fortune cookies say some pretty crazy things, but most of them are accurate, if carefully interpreted. They can also sometimes spawn some sort of self-prophecy, making them even more relevant. However, I have never known fortune cookies to be themselves prophetic in nature, until tonight. In a hissy fit brought on after a bad batch of cookies that indicated that I should clean while my husband vacations, I changed up our traditional fortune cookie ritual. My children were thrilled by their somewhat generic but appropriate fortunes. My husband doesn’t remember his, meaning it too must have been generic as well. Mine, as you can clearly see above, was a message from the heavens. I am coming out of a fantastic week in which I enjoyed a traditional bi-annual birthday lunch date with a friend. I just spent weekend playing with three of my longest standing (note I didn’t say my oldest) gal pals, just as we had before children and mortgages. I am also lunging head first into a reunion with a best friend that I haven’t seen for a year, and with her she brings a baby I have not yet smothered in kisses. To wrap up my upcoming week, we have a HUGE gathering to celebrate my work family one last time before we are shuffled and divided. I have moments from time to time, where I feel overwhelmed by change and smothered by fear. Often these are the times when I feel the most guidance from above. During these moments, and I can count the times on my fingers, it is as if I can literally feel the hand of God reach down to steady me. This time I think he steadied me and then propped me up with the blessings that are my MANY, MANY AWESOME AMAZING WONDERFUL friends. I know I often get sappy about my blessings, but I am just not sure anyone else is as lucky as I.
I was telling one of my IRL friends about you this weekend. Told her you were straight up crazy for me, but that I still let you be my best make-believe friend.